You may have noticed, I love unusual designs. While the unquestionable star of my collection is a Voere VEC-91 electronic rifle, I have several revolvers in 455 Webley and 480 Ruger, breech loading pistols, rolling block rifles, and every action design that I could lay my hands on Gunbroker. I also love blowback action for its incredible accuracy - see my reviews of Ruger MKIII and P64 pistols - because a $300 pistol with a blowback action will give a good run for the money to a $2000+++ 1911. One big problem with it though - blowback action is limited to a low-power calibers, because the recoil becomes unbearable, and the weight of the slide impractical starting with approximately 9mm Luger (HiPoint makes . So when I first read about Remington R51 a few years ago, I was super excited. A blowback-like mechanism (technically, it is called hesitation locked) in 9mm Luger? Yay! I was able to paw it at the Shot Show 2014, and... nothing. There were rumors of small shipments, then recall, than relaunch at Shot Show 2015, then nothing again. And then, suddenly, a flood of availability - every distributor had it, every distributor had hundreds! So I grabbed three, one for myself, two for store. This is the story of one of them. Please note - the gun reviewed here is the second generation of R51 made in 2016. R51 is a subcompact. It is 0.34" longer and 0.35" taller than Glock 43, and has the same barrel. 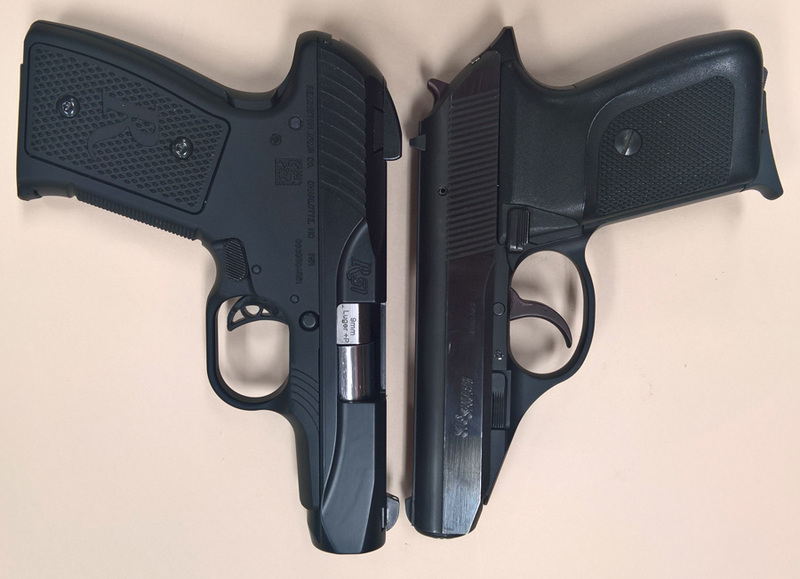 It is pretty close in dimensions - and shape - to Bersa Thunder and Sig P230. Here it is with the bananaSig for scale. 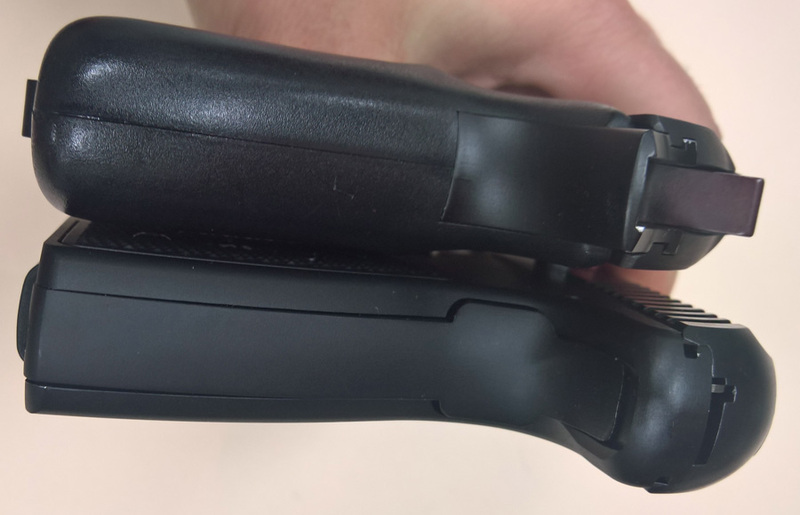 You can see that the grips on R51 are appreciably thinner. It fits my hand well - but people with larger hands usually find it less comfortable. The trigger is neither particularly good, nor particularly bad - it is okay for a carry gun. The pull weight clocks at 7lb. R51 borrows the grip safety from 1911. Unlike 1911, this is the only safety it has. I don't know if this is a wise choice - as you pull the gun from the holster, you will be squeezing it by the handle - at the same time disengaging the safety. Are we going to be hearing about an "R51 leg" soon? Given the unique internal mechanism, I took mine apart right away. Remington has a very nice video published about taking it apart. It does make the process look a little easier than it in fact is. You do need very strong hands! My own experience with taking an R51 apart and putting it back together is documented here. In short, it is quite difficult - much harder than field stripping most other modern pistols. This is not unusual for an older design - but it will for sure impact acceptance of the gun in the marketplace. This is how the pistol looks with its guts out. Let's zoom in on them. You can see that though the hammer is hidden, it is still present in the pistol. Just like FN Five-seveN, it is a normal hammer-based action. The serrations on the barrel are very unusual. They are there so that one can hold the slide by the barrel while action spring is compressed. On the other hand, these serrations are rubbing against the barrel channel of the slide when the pistol is fired. It seems that there is an opportunity for these parts to wear on each other. The milling on the breech end of the barrel is also more complicated than usual. Despite it's relatively low price, the pistol is probably more expensive to manufacture on average. R51 has an interesting "inverted" rear sights which are designed to minimize catching on clothing when the pistol is withdrawn. The slide has every corner nicely rounded. ...because of the pretty unusual separate breech lock which on almost all other pistols is machined into the slide. But not here. The breech block looks almost like an SKS bolt. Note that the extractor "spring" is not actually a spring at all. It is a piece of rubbery material. Did I mention that the spring is very, very strong? Well, it is. And considering that throughout most of the disassembly and reassembly you are supposed to keep it compressed by hand - it is a problem. Unlike most guns, in R51 the spring wraps around the barrel itself - there is no guide rod. R51 is a single stack pistol, and the magazine holds only 7 rounds. This is one better than G43 - but G43's magazine can be extended to 8 rounds. Note the follower - it is designed to push the front of the round up to enter the barrel ramp. As we will see below, it does not quite succeed at it. One thing that I expected from the gun was accuracy. After all, this is a blowback-like design, and blowback handguns are usually much more accurate than the price might suggest. This is why I rushed to buy this gun in the first place. Unfortunately, I was disappointed. This is a couple of targets that were shot at 10 yards. 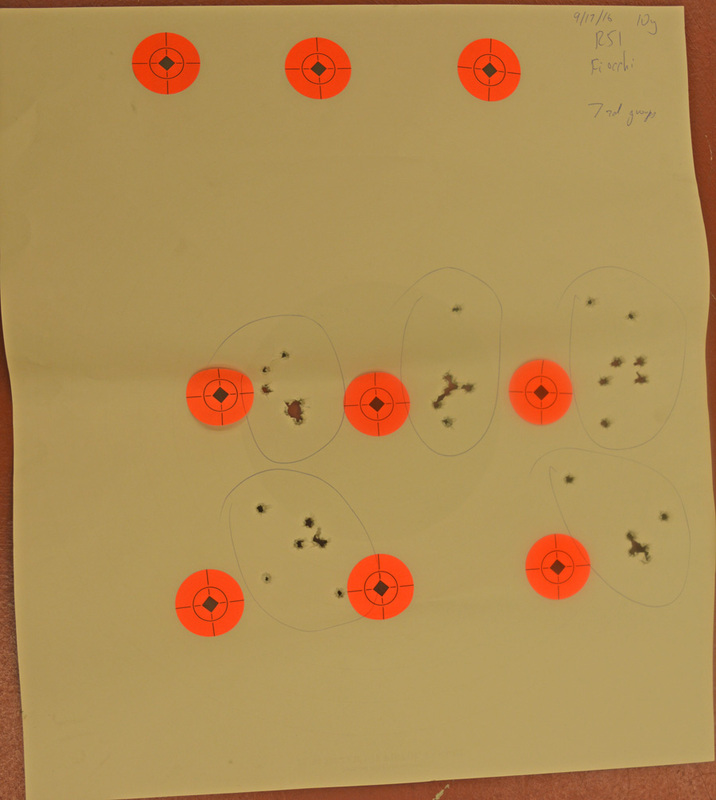 The gun was consistently shooting 1.5-2" low and 1.5-2" to the right. 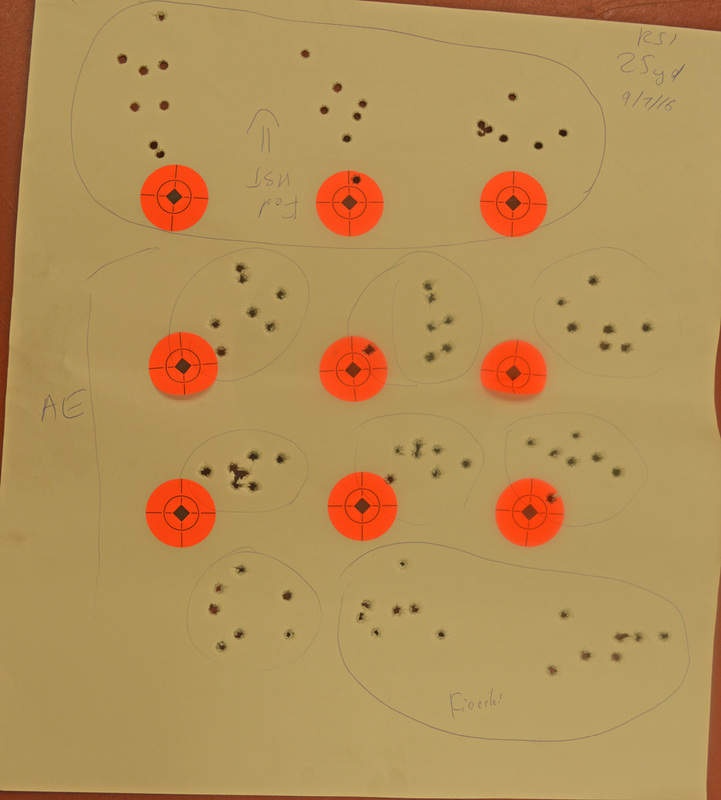 Shooting to the right is not a problem, as the windage is adjustable. Unfortunately, elevation is not - and thus my R51 is likely going back to the factory. This is how the target looks at 25 yards. One group was fired at 6 o'clock position on the black bulls eye, the other one - at 6 o'clock position at the red bulls eye. As you can see, accuracy leaves quite a bit to desire. When I was shooting the gun, the first round often caught on the ramp when sent into the chamber. But the spring was really strong - and the slide would jam the cartridge into the chamber. Then, when the action reloaded automatically after the shot, the slide movement was slower and springier than I would expect, different from other pistols - as if the rounds were still getting stuck on the ramp, but were jammed in. I also noticed that often the first round went quite a bit away from the group formed by subsequent rounds. Overall, I think it was a mistake for Remington to come out with this design. It is hard to maintain, it is not accurate, and the design choice for the safety is questionable. The magazine capacity is on the low side. The grips feel too small for the people with average and above average hands. I predict that the gun will be pulled from the shelves within a year or two. In my opinion, the only reason you should buy this gun if you, like me, are a collector and you are interested in unusual firearm designs. If you want a practical pistol for a range or self-defense - stick with something else.